The evocative art of Giorgio Vigna is rooted in nature’s metamorphic phenomena. He fluidly interchanges the artistic mediums of sculpture, works on paper and jewellery, inviting us to understand our relationship with the cosmos through engaging our senses. His works trigger our imagination through their textures, sounds and movements, evocating the mystery of our attraction to the natural world. In celebration of Elisabetta Cipriani’s 10 years of collaborations with the world’s leading visual artists, we invite one of the gallery’s first partners, Giorgio Vigna, to discuss his relationship with wearable art. GV: It makes me very happy to know that I am one of the first artists your gallery represented. It has now been ten years! EC: Yes, it all started with our first collaboration. You were there from the beginning. How has this journey together been like for you? 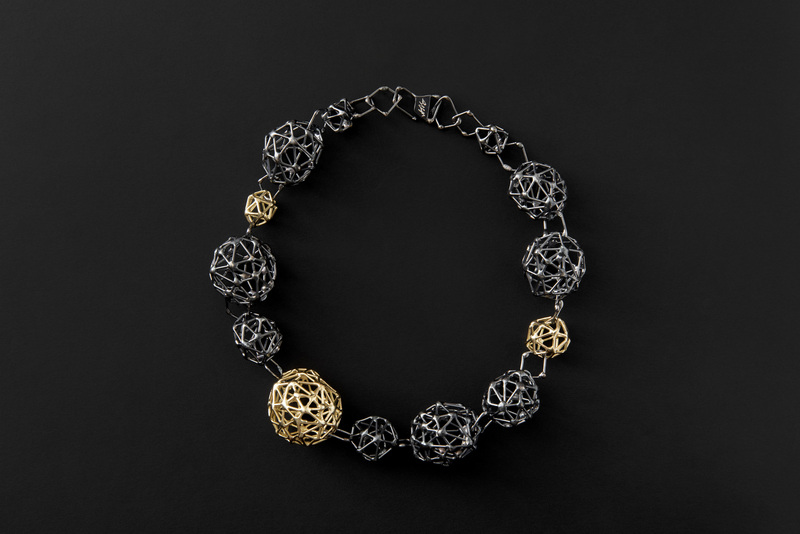 Giorgio Vigna, Segmenti, 2018, oxidised silver and 18 kt yellow gold necklace, unique and signed.Photography credit: Francesca Moscheni. GV: I know that you appreciated my art even before you opened your gallery. Working together has been important for me because it has always made me feel that I was in good company. It also gave me the opportunity to show some of my works that I could not show in other galleries. You developed an interesting point of view on jewellery, with which I personally completely agree with. You elevate the medium to a true artform. EC: I am very happy we are still working so closely together. This year, you are curating my booth at MiArt fair. You created a dialogue between the wearable art works by the different artists that have worked with me. What similarities and differences have you noticed between the pieces when doing your research for this project? GV: I saw the different points of view on jewellery because every artist has her or his own identity. And for many of them it has been a new expression. But you have been the common thread – their link to the medium of jewellery. Of course, jewellery is connected to the body and this is one characteristic that unifies all the artworks. When I studied all of the jewellery that you have edited, I realised that there is another, subtle link that connects all the works. I have tried to connect the individual pieces of jewellery with this transparent thread that has put them together, to understand what connects each piece to a part of the body, to a part of the mind. It is a very subtle narrative that you might not see at first glance. But after ten years of your work, a dialogue has certainly emerged between your artists and in my curation, I wanted to focus on this subtle yet important link between the pieces. Corpo (Dolore) [Body (Pain)], 2019, a display cabinet curated by Giorgio Vigna for Elisabetta Cipriani’s booth in MiArt Fair 2019. Top image: Sophie Whettnall, Bracelet and Ring, 2019, 18 kt yellow satin gold, respectively, signed and numbered. Middle image: Kendell Geers, Within Earshot, 2011, 18Kt yellow gold bullet earrings, signed and numbered. Bottom image: Adel Abdessemed, Game, 2016, 18kt white gold and silver earrings signed and numbered. EC: As you mentioned, jewellery is created to be connected to the body. What is the importance of the wearer’s movements and emotions for your wearable art works? GV: It is true that jewellery is connected to the body. But I think an important reason why me and you work together is because you agree that the body is just an excuse for you to wear jewellery. The body is not a wall where you hang the artist, the body is a totality of its senses and emotions: sight, hearing, touch, smell… Each artist that you have been working with is connected with this. I never felt that jewellery is just about decoration. Women have a very strong felling about beauty. But beauty is not the beginning it is a result of the research that we both make on creating jewellery. 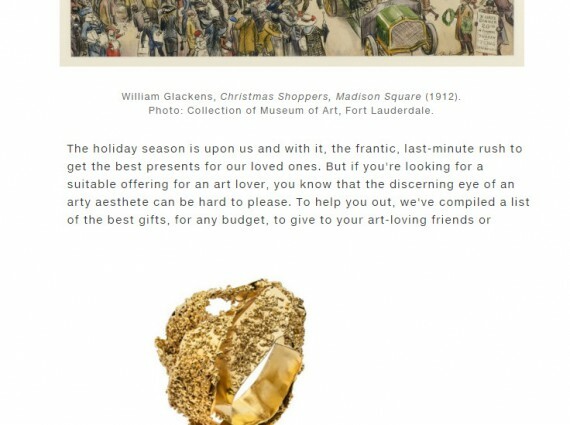 I think this the right way to view jewellery made by artists. 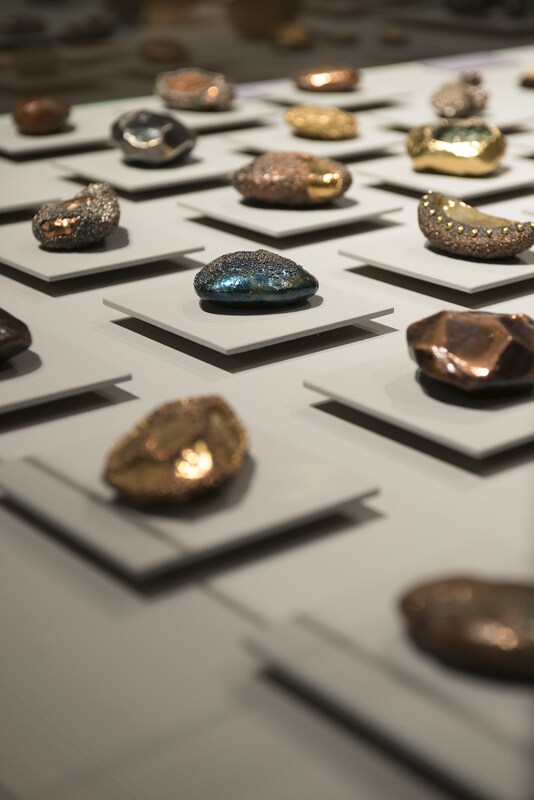 EC: In your case, artistic research is often focused on the primordial elements of nature, which you translate into the mediums of gold, silver, copper, and glass. These are precious materials of natural origin, which have been venerated for thousands of years across human cultures. Do you believe they have a special energy, and do you have it in mind when you are creating your wearable art? GV: I have never thought about this. Thanks for making me think about this! For me it is totally natural to use these materials. I have never been into plastic or any materials which are not completely natural. For me it is like this – for example, when I use gold, I always see it as the material that represents the soul. When I make jewels which take the form of a completely natural shape, but there is a cut in the pieces, like a stone with a cut, the cut reveals gold, which means inside it is precious. Like the Roccia (Rock) ring, where the body is the rock, and the soul is the gold. So the body contains the precious part of us, our soul. 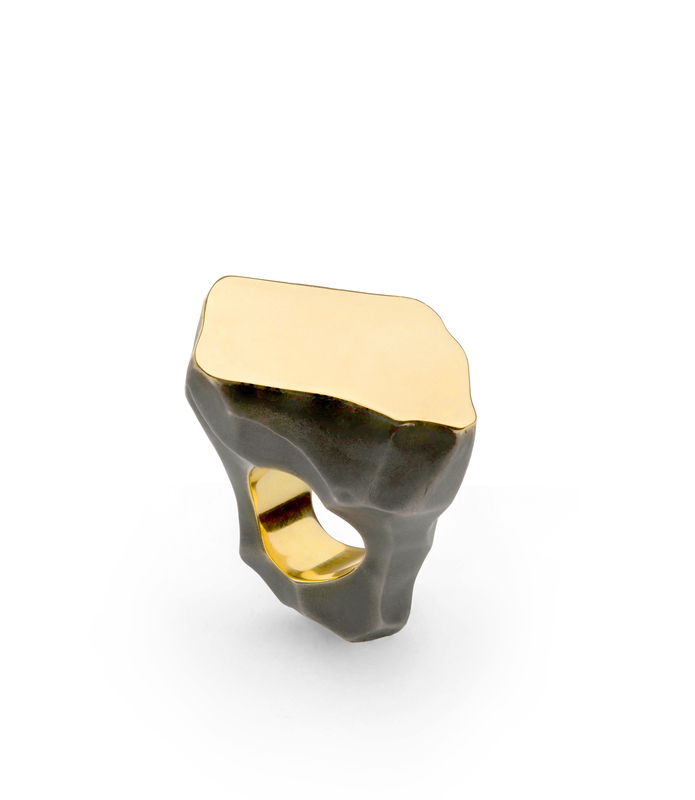 Giorgio Vigna, Roccia, 2015, ring in oxidised silver, 18 kt yellow gold, ring in oxidised silver, unique and signed, Private Collection, London. Photography credit: Paola Oregioni. EC: And what is the meaning behind your use of copper? GV: For me copper is fire. If you put a flame on it, it will change colours like fire itself. And of course, copper is like fire a natural phenomenon. When I use glass, I usually use clear transparent glass because for me glass is water, like solid water. Not ice though, just solid water. Ice is a completely different story. In my work, all these things are connected. So yes, I believe that there is a special energy in these materials. 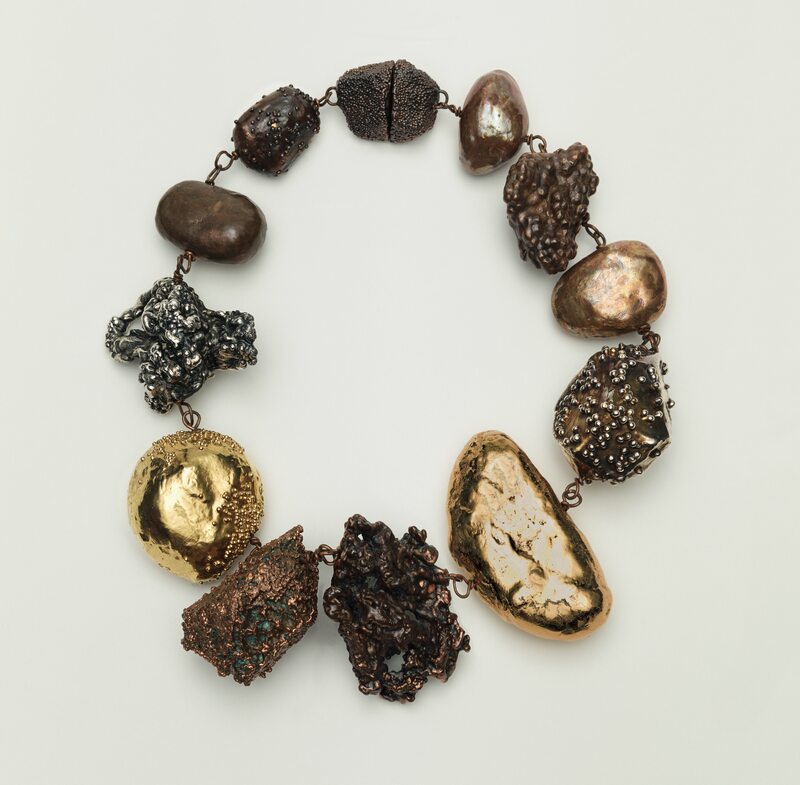 Giorgio Vigna, Sasso, 2003, Mixed media, copper, gold, silver, magnets necklace, unique and signed, Olnick Spanu collection. Photography credit: Francesca Moscheni. EC: And your pieces utilise this energy to appeal to the body’s senses. Further to what you said about your use of copper and Murano glass, the silver granulation on many of your jewellery has a beautifully earthy texture which engages the touch, and the swishing sound of the gold seeds ricocheting off each other, within some of your hollow rings and pendants, lifts the senses into heightened, somehow spiritual state. 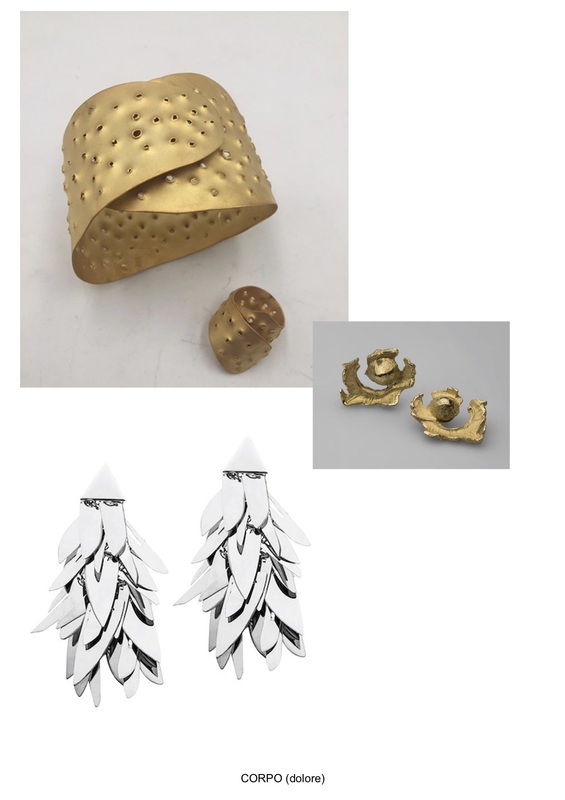 What do you think these natural elements and sensations mean to the woman who wears your works? GV: I think that the body being in contact with these powerful natural materials must be a very meaningful experience. When a woman wears my jewellery, it is in contact with her body and this gives her the sensation, the feeling of carrying nature with her. I always say that when I am in front of a sculpture, for many reasons, I cannot touch it. But when I am in front of a jewel, I am obliged to touch it. It is the tactile element of jewellery which attracts me so strongly to the medium. Touch is a human being’s first action; it is the first attempt at understanding the world. In jewellery – in my jewellery – touch is a very important aspect. This idea of going back to the first act of a child. In this sense, I think I am still a child because even if my jewellery pieces take on different shapes and meanings, the main part is that you have to touch them, you have to be part of them. I know I sometimes make pieces which are unwearable, but I am aware of that. I am not just making a joke – because when I call a sculpture a jewel, people touch it and I love that. EC: All the people that own your jewellery are always happy to hold them, as if it is something that reassures them. The touch, the sound, they like it very much. GV: Another aspect of my work is that each piece is evocative rather than representative. When through my pieces I discuss nature, I don’t want to represent nature, I want to evocate something about it. I very strongly believe that pebbles from the beach are much better than my jewels. I am sure about it. When people go to the beach, they choose a pebble. Why do they choose one over another? I want to evocate the mystery of this attraction towards a piece of nature. 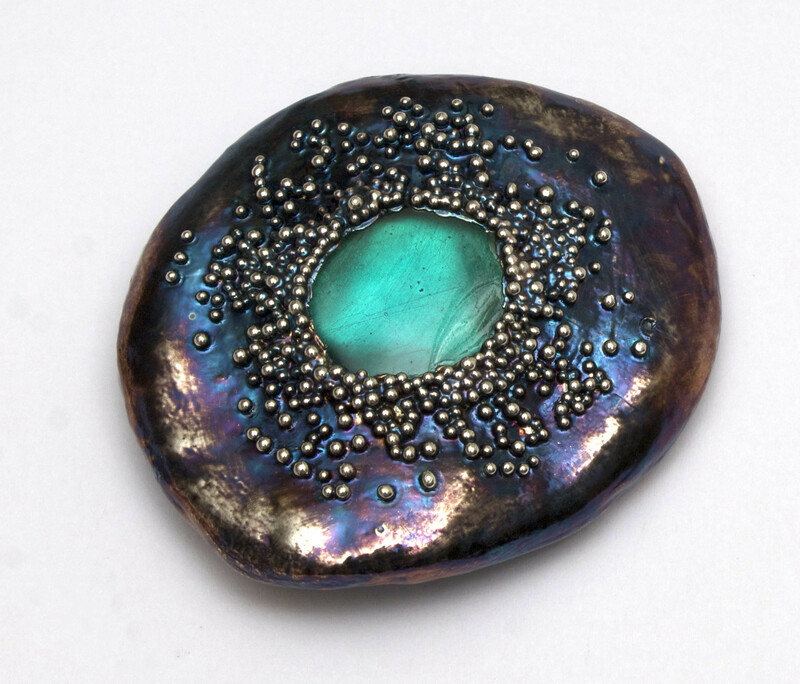 Giorgio Vigna, Sasso, 2018, mixed media: gold leaf, oxidised silver granulation, copper, Murano glass, magnetic brooch, unique and signed. Photography credit: Paola Oregioni. GV: Exactly! I think this very important – to evocate. Ok, for example, we were talking about glass, and that for me clearglass is solid water. 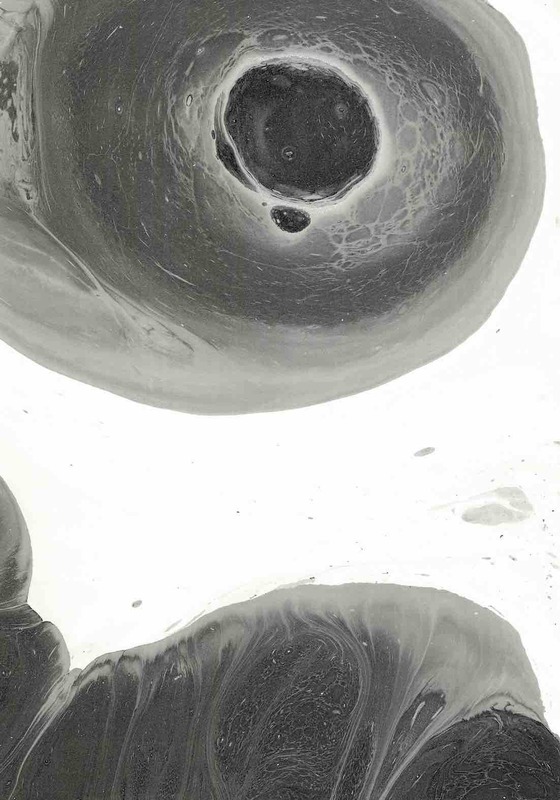 There is a parallel there with my works on paper, where I use simple black ink on water, and then they collide together to form shapes that take me to another planet because they evocate a cosmos. You can go closer into it, you can go backwards in it, and there is always a strong feeling present. I think my jewellery is a little bit similar in that effect. Even when my jewels aren’t being worn, when they are laidon your table, they are not dead. I think traditional jewellery – not art jewellery – when it is not worn it is asleep. I am not against traditional jewellery, it just a very different story. EC: I completely agree, your jewels have a sense of life whether they are worn or not. I want to ask you about another aspect of your work, which I think also gives life to your pieces. The element of surprise. The mesmerizing swishing sound of your rings and pendants, the free movement of the pearl in and out of the Segmenti ring, and the unexpected lightness of your brooches and necklaces, which have beautiful patterns on their reverse side… What is the artistic intention behind these surprises? GV: These things become very natural to me. I think that the artistic intention is to encourage a continuous awareness of the piece being in contact with you. For example, I went a party with my wife, and she was moving like the Italian people do when we talk. She was wearing the Segmenti ring, the ring with the pearl inside it, and the pearl moved all night long and it created a little sound. This movement keeps you aware of the piece. Perhaps this is why this ring with the moving pearl has become my iconic piece, which I have been remaking and rethinking for thirty years now. This is another part of my work that I like – there is no end to it, no beginning, my art is alive today, yesterday, tomorrow, in 2 years, in 5 years. Nothing can be seen as an old piece. Coming back to surprises, there is also a superstitious element about them but in a good way. I always have my pockets full of little charms that I like to carry with me, because I need to touch them and hear their sounds. For the same reason, often my jewellery pieces become, for those wear them, like talismans, which they can touch, move and feel in each movement, in every moment of their life. EC: All your pieces are unique, one of a kind creations. To ensure their uniqueness, you have a huge archive of all the jewellery you’ve done in the last 30 years. How do you manage to always make them different, even if it is the same ring concept such as the Segmentiyou just spoke about? GV: A couple of days ago, I went through my draws and I saw some old pictures. I realised that 30 years ago, the Segmenti project began with an important moment of research, which resulted in one ring. For the next 30 years, without looking back at the picture of the first ring, I have done a huge amount of work with that idea. This showed to me that my work is a cycle that goes around, and sometimes it goes back to its origin. But it isn’t a turning back because I opened the drawer and thought, “oh look, let me create it now”. Because when I have an idea, it is always evolving in my mind. And in effect, in my research some of my works are like embryos, and at the right moment they blossom like flowers. Sometimes that moment comes after 3 years and sometimes after 20 years since the idea first came into my mind. EC: Tell me more about how your creative ideas flow from one artistic medium to another. You have been making sculptures and works on papers at the same time as you have been making jewellery. Is there a continuous dialogue between the different mediums? Giorgio Vigna, Sospeso, 2014, 18kt yellow gold and oxidised silver pendant and ring, signed. 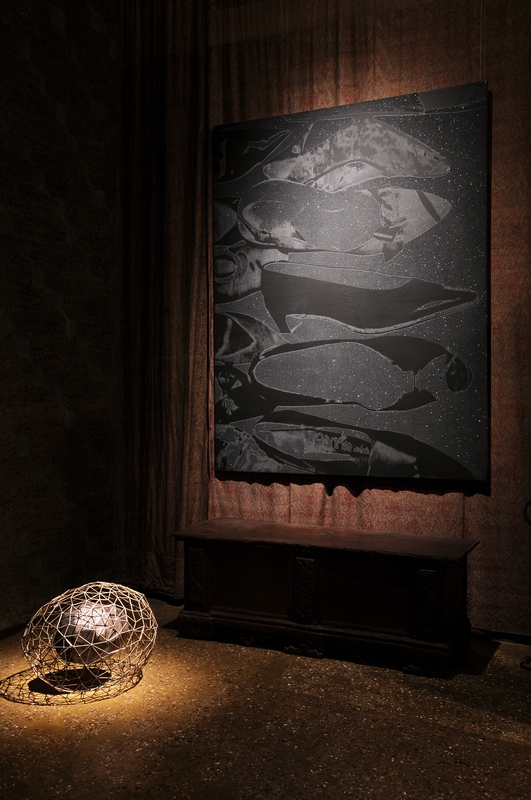 Giorgio Vigna, Sospeso, 2001, mixed media: copper, silver, bronze sculpture, Palazzo Fortuny, Venice. Photography credit: Jean-Pierre Gabriel. GV: My art works are always somehow connected to each other. Sometimes I am showing some of my jewellery works while behind the scene I am working on sculptures which engage with a similar concept, but I decide not to show them together. I use the same material in my jewellery and in my sculptures, so there is always that connection. But it is important to say that I never see my jewellery pieces as small scale sculptures of my larger scale sculptures. I only did that once in the Sospeso project I made for you but that was because I wanted to really have it in the jewellery form. Often when you compare artworks and jewellery by the same artist, it is only the scale that changes. With me it’s not about the scale. EC : Yes, there must be a concept behind the jewel. A reason to choose this medium. If it’s a miniature of a big sculpture it doesn’t make sense. 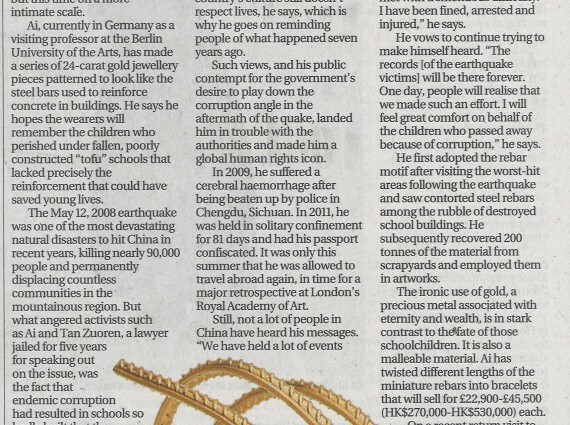 GV: Yes, as an artist, another aspect that appeals to me about jewellery is that I can handle it myself. When I am doing installations, for example, there are many other technical problems and etc. I am the type of artist that likes to handle everything myself. EC: Well this leads me to the old question, which I am often asked – “Is jewellery art?”. For me, you are the perfect proof that jewellery is indeed art, because you use the same concept and energy in jewellery as you do in your sculptures and works on paper. What would be your take on this question? Giorgio Vigna’s 2013 solo exhibition Stati Naturali, Musuem of Castelvecchio, Verona. Photography credit: Francesca Moscheni. GV: I have never had to think about this. Yes, for sure, jewellery is art. Because through jewellery you can express the same meanings that you can express through other artistic mediums. Sometimes the scale changes, sometimes the material can change, but for me expression is totally fluid. I’m talking about myself, I know it is sometimes difficult to make other people understand this but this was never something I had to understand for myself. 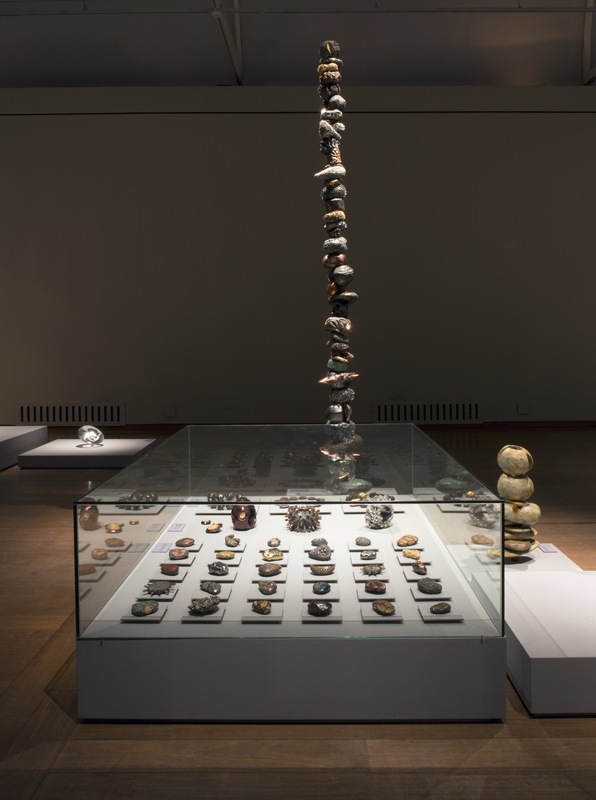 For example, in my 2013 Stati Naturali exhibition at the Musuem of Castelvecchio in Verona everything was connected, the sculptures, the works on paper, the jewellery. There was no distinction made between the mediums. My main inspiration is nature, which gives me an incredible wealth of options in terms of materials and the visual forms I can create with them. I have never been a slave to a technique. I guess I feel this freedom because in my work I have a concept not a style. EC: Tell me more about the connection between the works on paper and the Segmenti rings. 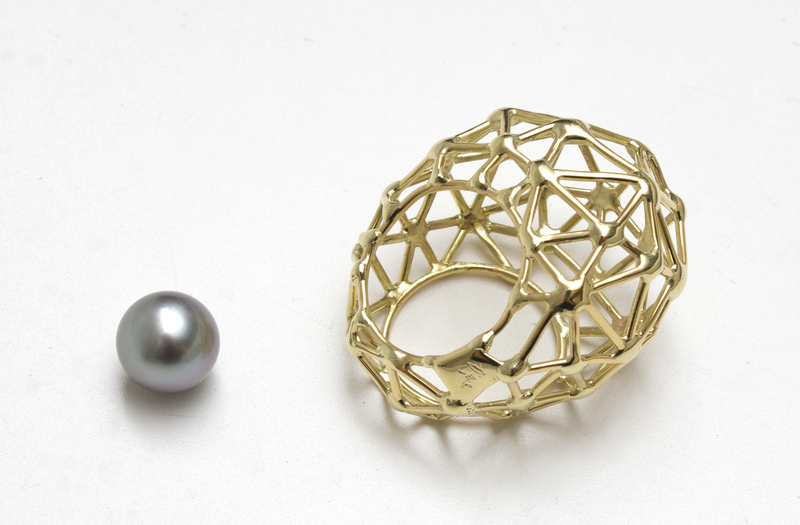 Giorgio Vigna, Segmenti, 2017, 18kt yellow gold, Tahiti pearl, unique and signed. Photography credit: Paola Oregioni. GV: When I create the works on paper, I put ink on water, and this ink spreads on top of the water and the colour of the ink breaks itself with small bubbles, like particles. I put the paper on top of this water, so between the paper and the water there is the ink and the paper is dry, so the ink get attached to the paper. I then I wash the paper and dry it. I have been using this technique since I was 19 years old, so for more than 40 years now. I call these works on paper “Acquatipi” (watertypes), a “lemma” that I invented to define this kind of work. Sometimes I leave the ink on the wet paper for a long time, and this ink breaks into small particles, and these particles become inter-connected segments. A similar interconnected pattern of segments can be seen in my Segmenti ring. Except in this case, the segments are created by my hands. Interestingly, I only recently realised the connection between the ink segments on my works on paper and the visual pattern in my jewellery. EC: And when you first started creating works, did you begin with jewellery or works on paper? GV: I first started making art when I was in primary school, I painted. I was making small little houses. I was very happy because the teachers hung my pieces in the entrance hall in the school! I was a very active child, and art became another way of expressing myself and my energy. I started doing jewellery when I was 15. Thinking back, I started making jewellery at the same time as when I consciously became an artist. To experience the powerful magnetism of Giorgio Vigna’s wearable art, please visit us at the MiArt Fair 5-7 April in Milan (booth O5) or at PAD Monaco 26-28 April in Monte Carlo (booth 6). 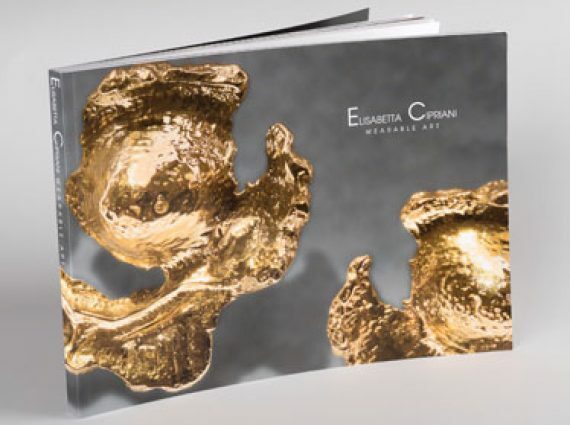 For more details about the works, please contact us on info@elisabettacipriani.comor +44 (0) 207 287 5675.